On this day in 1893 Keir Hardie, the Liberal-Labour MP for West Ham, formed the Independent Labour Party during a conference held in Bradford with other delegates from various labour and socialist organisations. Growing increasingly tired of partnering with the liberals it was his contention that the working classes of Britain would need their own independent political party. This party, socialist in its outlook, was to be rooted in the trade unions, despite being at the time still politically liberal. Seven years later in 1900 the Labour Representation Committee was formed, which consisted of socialist organisations like the ILP, the Social Democratic Federation (Britain’s first socialist political party), whose aim was to gain independent Labour representation in parliament. In its early years one didn’t join a body called the Labour Party, it was only possible to join one of its affiliate groups – the ILP being the biggest one. In 1910 42 Labour MPs were elected to the House of Commons, thanks in no small part by Hardie, the Fabian Society and other trade unionists (which given that one year before they could no longer fund political parties owing to the Osborne judgment – passed by the House of Lords – was a major victory; one which was to be short lived however). As time wet on relations between the ILP and the Parlaimentary Labour Party (PLP) grew rather fractious. The independents, now led by James Maxton, felt they should have a seperate system of discipline than the PLP who did not agree. At this stage, in the 1930s, the ILP started to become very radicalised, heavily influenced in part by Stalinism. Labour from its outset was a broad church of left wing and working class politics, and so had been used to difference, but with the ILP strategies were very much in conflict. The policy of Clydeside ILP MPs, for example, had been to harass and confront Conservative and Liberals MPs in parliament, especially on the issues of poverty and unemployment. The PLP viewed this as cheapening their standing which led to confrontation, while the ILP accused the PLP of deviating from its socialist principles. In 1932 the ILP left the Labour Party, along with four of its MPs, evoking a scathing response from Labour leftwinger Aneurin Bevan who described the ILP’s disaffiliation as a decision to remain “pure, but impotent”. Such, in fact, is the reality for lots of political organisations who supposedly work in the interest of left wing or working class politics – seeing difference and factionalism as a duty rather than a political reality of which to overcome in organised politics. Take for example Duncan Hallas’ notorious 1985 (published 1987) article, simply called Sectarianism. After disputing the Militant definition of sectarianism (to work towards socialism and the workers’ struggle from outside the Labour Party) and supporting the motion that the Socialist Workers’ Party should support the left inside the Labour Party where need be, he notes that this is by no means the same thing as saying “the SWP ought to dissolve itself into the Labour Party (or to appear to do so whilst secretly maintaining its own organisation)”. Revolutionary socialists are better placed outside of the party anyway as they can avoid conflicts over positions, candidate selections etc. I’m not a revolutionary socialist, so this poses for me no problem. However on a matter of principles, Hallas’ first reason disregards the common knowledge that the world’s problems do not begin and end in a political party – no sane Labour Party member on the left would suggest that advancing socialism can only take place within the party, disregarding the work that takes place in the workplace and by unions. This line seems to produce only a straw man argument, when in fact – and as Bevan was wise enough to take note of – by not working from within the largest socialist party in Britain, the dutybound factionalist only makes his “purity” impotent. The second reason, more revealing in some ways, can serve as a commentary on the reality of a Labour Party being tilted further and further to the right (or in the case of Ed Miliband, being tilted further and further to total silence). While rejecting Hallas’ straw man argument in his first reason, we can accept that it would counter received wisdom to do anything other than maintain presence of workplace representatives, even if “struggle in the workplaces is at a very low ebb”. This, for me, still doesn’t explain why a socialist, of whatever variety, is better placed outside, rather than within the Labour Party. Which brings me to Hallas’ last point. First thing to ask is how do the SWP avoid friction over positions? It seems obvious to me that this is a reality of any political organisation, and is no good reason to seperate off from a broad church party. Clearly the more a broadly socialist body of politics is split, the more staurated it becomes, and the weaker it is placed to join in the struggle of the working class. This is not the opinion of many on the left, for whom splits and splinters are an obligation, stipulated by the word of zealous, power hungry Russian dictators safeguarding their own corners. But at what price? Small, inadequate left wing parties shout in the wind, by the sidelines, while the Labour Party, currently in oppositon to a government demanding ideological cuts over jobs and growth, struggles to tell its arse from its elbow. Refusal to work in the Labour Party, from the ILP back in the thirties to the Greens and the SWP now, is the scourge of left wing politics. Statue aside (in his words, “am I bothered”) it is so easy for some people; we’ll support our tribe come what may, and that’s that (no doubt you’ve heard the argument before; we should support Blair/Mandelson as they bring in the votes, forgetting the price the party has had to pay for that experiment). Only for anyone in the Labour Party who really cares about it, and are politically committed to boot, this will not do. Surely a nodding dog who promised everything to everyone (like Barack Obama at the start of his term) would be more electorally successful, but the Labour Party is a political party, historically it has been a political machine and a socialist one as well. While it’s trying to please everyone it is pleasing nobody; Blair may have won his pathetic game against his contemporaries in the Commons, he may have smiled at the correct moments in a PR attempt to woo the heartstrings of the electorate, but he had no political fire in his belly to win the argument for socialism (in fact, by the end I’m sure he’d rather do anything else) and therefore we in the Labour Party should not “support” him. No way. Yesterday I played a game that my Grandad received for Christmas. One of the questions raised – aimed at a certain generation – was: “should it be absolutely right for a person to fight for their country over anything else?” I was the elephant in the room, among mostly ex-service people (my parents and grandparents included) who said no – but I stand by my answer; today more than ever nation is a tribe that can serve only as sentimental value, ideas and convictions is a dish best served political, and in an age of postmodern disdain for ideas that can guide your uttermost convictions, it is the task of the left today to fight against that current – nationalism and tribalism were bad for politics in generations previous (obviously I justify British presence in WWII, but Churchill was an imperialist, it’s an old point, unpopular and often disavowed, but it’s true) and are bad today. But who today are really to blame? Reading the above may lead you to think I’m not myself slightly tribal to a political party, but in many ways I am, but not in the sort of way damaging to my political convictions. My own brand of Labour Party tribalism means that I think TonyBlair was a monster – and it’s because I care about the party so much that I can say this. Those who send messages, such as the one above, are more damaging to the party than they realise. Who I blame for the rightwards trajectory of the political party I am a member of is not necessarily those rightist figures themselves – it is young members of Trotskyite splinter parties like the Socialist Workers Party. In the days during the militancy period in the 80s, people were thrown out in a Kinnock, McCarthy-esque, early New Labour drive to rid the party of socialist ideas – history denialism. There were two elements to emerge; an element who embraced the sectarianism of the left who created the far left pressure groups we know awkwardly selling papers today, and then Grantite-entryists who as best as possible worked inside the Labour Party with the intention of bringing socialists together. Younger generations inside those parties don’t face the same problems; for them the Labour Party is sinking ship composed of capitalists and warmongers. However, these people have less fire in their bellies than the right wing of the Labour Party whose socialism has died with the size of their mortgages. While sectarian factions choose not to touch the Labour Party with bargepoles, so the right of the party become vindicated in their place, and with the slow death of New Labour, and the sloppiness of Ed Miliband, now is the time to work inside and alongside the party, not against it. Owing to the constitution of the small far left parties, and their continual relevance among young socialists as opposed to working inside the longest existing, and historically the most idea rich socialist party in the UK – the Labour Party – they are by their very nature sectarian, and therefore it is justified to shut the door on their personal vindications to the Labour right wing, while offering a place to them if they wanted, and sharing ideas where possible (like the Labour Representative Committee do with smaller parties). It is not only true, but also necessary, that all that is solid melts into air and change disturbs the inner functioning of people and places over periods of time. This notion is as true as for towns, villages and cities as it is for us as humans. But there is something significantly more influential about the disruption that is caused by a geographical location unto its human subject, something deeply and incalculably disruptive that cannot be said to be returned in kind. The task of qualifying to what extent the geographical landscape is said to affect the normal functioning of the psychical realm is little more than a footnote in the Situationists’ repertoire, yet it is their work and influence that has gone the furthest into such a collation of results. The word which has come to define the task of qualifying how far a geographical landscape is said to be a determinant on the human subject is psychogeography, and as can be expected it is usually anthropocentric in that it concerns itself with measuring the extent to which passive places alter active minds, but less is said within psychogeography of how minds alter places since this is delegated to the realm of town and country planning. Equally, urban geography at its elementary stages tended to concern itself with the extent to which towns could influence its surrounding area. Sir Dudley Stamp in his crucial book Applied Geography drew up two points that summarised the raison d’être of urban geography, namely the ‘study of the actual town itself’ and ‘the influence of the town on its surroundings’. Now maintaining allegiance to these two points I would like to supplement them with my own, scilicet the influence with which the surrounding area has on the town itself. Highlighting the influence furnished upon a town by its neighbouring area sutures the gap present in Stamp’s urban analysis, or what I am prepared to call topographical revealing. It is surely necessary when focusing ones attention to the location and history of a town to look at what makes it distinct, what makes it unique, whilst also observing the part it has played in developing its borders. But if one is to really reveal the power relations at play, one must go further. With this as my backdrop I can begin to reveal the relationship between Pitsea – a small town in South Essex – and London. Observing Stamp’s agenda for urban geography and applying that to the history of Pitsea will assure some interesting revelations, including the apposite land it once had available to provide an arms factory and accommodate pillboxes during the Second World War, and how being situated on the Thames Estuary made it ideal for exporting produce. But with the inclusion of my third point, I can reveal how Pitsea has always been something of a plaything for London, an extension for its own purpose, an experiment and dumping ground, a place that jumps when London tells it to jump. With its mention in the Domesday Book, it is acknowledged that Pitsea existed as far back as the Norman Conquest, but according to the Rochford Hundred Field Archaeological Group managed to go unnoticed by local historians. As T.C. Chisenhale Marsh’s translation of the Domesday Book relating to Essex explains ‘Pitsey is rather inland for land,’ one possible reason as to why there is little to no pre-Norman history on Pitsea, other than blind speculation. It’s the legitimacy of this view that lends itself to the common perception that Pitsea is a kind of product of Basildon new town, a residential remainder. Its geographical location, however, does form its name, emanating from pic (point) on sea. The proximity of the point to the estuary rendered it quite ideal to install a public a railway line, especially given the uselessness of all the surrounding boggy marsh, made even more useless by its agricultural ineptitude, of which more in a moment. The Fenchurch Street line was initiated in 1852, eventually reaching Pitsea in 1854 and commenced proper commercial use by 1st July 1855, joining all other sites linked by marsh and creek, Benfleet, Leigh-on-Sea and Standford-le-Hope. Most of the designated area for Basildon new town (all the areas once under the jurisdiction of Billericay, with its then Member of Parliament Bernard Braine) – and the south east of England – is covered with London clay, a marine deposit, well known for the fossils it creates and the immense thickness (150 meters) – able to support the deep foundations and tunnels found in and around Essex – of the Ypresian age (which span from 48.6 to 55.8 years ago), which on the geological timescale (time that is used by geologists, palaeontologists and other earth scientists to describe the timing and relationships between events that have occurred during the history of the Earth) is the earliest stage of the Eocene sub-epoch (which span from 55.8 to 33.9 million years ago). Owing to this, much of the said area is agriculturally unsuitable. And since 40% of the area swallowed up by Basildon new town was originally planned to be agricultural heaven, a re-think was made necessary. Pitsea and Vange were not part of the 40% of designated land for Basildon new town composing of London clay, instead they were composed of alluvium, the product of a heavy amount of dropped solid rock particles due to fast river flow, but still this meant agricultural incompetence. Production through farming and foods ceased to exist as a consequence, so another method of capital squeezing was needed (this couldn’t be any more apparent, and simultaneously a slap in the face, by the presence of a budget priced, chain supermarket called Farmfoods in Pitsea today). The commercialisation of Pitsea was not a problem for anyone with political punch near town. Dennis Hardy and Colin Ward in their book Arcadia For All note that the landowners near the railway routes were usually shareholders or board members of railway firms; they profited from diminishing farmlands and the volume of traffic that the development of the railway would bring. They, too, were probably happy to see the methods used by The Land Company, possibly the brainchild of Protheroe & Morris, who operated from the same address in London and the South East, and their estate agents who used techniques of wooing potential plotland development buyers with free railway tickets or cheap fares refunded to purchasers, not to mention the utterly frivolous champagne auctions they used to hold. It is noted that East London families would go out to the country for a cheap outing and come back property owners. Pitsea was soon turned into a place for Londoner weekend homes – hard to believe now. It wasn’t until 1925 that local entrepreneur Harold George Howard decided that Pitsea was going to be “something really special”. It was he who designed the Tudor style buildings around Pitsea in the thirties, the Railway hotel public house (now a place of brick throwing target practice for local bored youths, sheet metal instead of windows, grand ideas of a neolithic historical museum by idealistic councillors), the cinema (which has since been a successful bingo hall, now closed down, posters advertising local carnivals, shelter for rained-in early morning bus users), Tudor Mansions and Tudor Chambers with its cab firm, kebab shop, and betting office, and finally, Anne Boleyn Mansions used by Lloyds bank. His legacy lives on in the row of houses bordering the park that bears his name (Howards Park), and one cannot criticise him for his earnest effort. But even he could not have helped what was to happen to the area next, despite the efforts of many men. The German forces’ bombing of East London meant that many families were forced out of their obliterated homes, seeking a safe haven in nearby towns with land to accommodate them (and incidentally, if there is one good thing to be said about the digging up and destruction of East end history for the purposes of the 2012 Olympic games, it is that excavators uncovered an unexploded bomb near to Bromley-by-Bow Tube station). It is precisely here that a parallel with settler hegemony, like that of the state of Israel, can be drawn: the Second World War brought about ghastly deaths and forced evacuations of many innocent people, but how to deal with populating another area of land was mishandled, with Israel it meant making second class citizens out of the existing Arab population, forced into suppression by the Nakba of 1948, with Pitsea, the re-accommodation of innocent people affected by the war gave legitimacy to the compulsory purchasing of over 10,000 homes, some weekend homes, some freehold owners, all for the good of Basildon new town. After the Second World War the Tory government only had the iconography of Churchill as muscle for their election campaign, needless to say it was Clem Attlee’s Labour government that won in 1945, bringing in many of the institutions we take for granted now such as the NHS. Owing to the housing problem after the war the Labour government introduced two new acts taking control of the issue; namely the Town and Country Planning Act and the New Towns Act of 1946/7. It was the idea to create new homes where possible, but the destruction of existing homes seemed a little counter-productive. It was here that the Residents Protection Association (RPA) took force, which campaigned against the creation of a Basildon new town on the basis that it would destroy existing homes. The Labour initiated acts generated much enthusiasm at first since it set out to clean up the district, finish unmade roads, fix unconnected sewers and deal with the cramped conditions many people lived under. However in the 1951 elections, due to the first-past-the-post system, and in spite of the fact the Labour party fielded a record number of votes (even to this day), Churchill’s Tories made it back into government. The first thing that Mr. S.A. Perry did, an owner of a London printing firm and a staunch ally of the RPA, was to write to Churchill on the 24th of September 1951 asking him to shelve the New Town plans. He received a reply from Churchill’s secretary on the 27th saying the Tories were not opposed to the act or the forming of a new town, but “the socialist Town and Country Act of 1947 imposed a most unjust basis for compensation”. After much campaigning, and even fielding George Ross, member of the RPA committee and author of The Brink of Despair: A History of Basildon 1915 – 1986, as candidate for the council, with modest success, it was realised that the slogan “Down with the New Town” had become obsolete when in the early fifties buildings were beginning to fall down. The Rt. Hon. Hugh Dalton MP, Minister of Housing, approved the first Master Plan for the new town, August 1951. The corporate logic over the introduction and overspill of Londoners had spelt the destruction of many people’s homes and had turned Pitsea into a consumer plot. There is something distressingly logical that Pitsea is the site of the biggest Tesco in Europe straddling over 125,000 square feet of floorspace. The new Masterplan for the area, approved in April 2007, and entitled the Regeneration, will provide Pitsea with 20,000 more square metres of retail space, which among many other things includes an opening up of Station Lane, the path that reaches the train station, which will include a French Market (and if there is one thing Pitsea is not crying out for, it is a French market). It will also fill space with 500 new homes, many of which are flats on the cusp of Station Lane itself, for the sole purpose of designing trendy flats appealing to 20/30-somethings, in order for easy access to the city; an act of blatant London subservience. No wonder there is an ink daubing of “EC2” on the fence that blocks the site where these flats will occupy; far from being a sign that East end gangs are rearing their ugly heads in Essex, it is a signalling gesture that the re-colonisation of Pitsea through corporate regeneration is imminent. The sum components of the Pitsea regeneration seemed designed entirely in order to make access out of it easier for part-time lodgers in trendy flats. Why else would Station Lane be such a focal point, why a French Market, why when housing prices in London are so, that millions of pounds are spent creating another bubble just waiting for 15 years of equilibrium elsewhere, before a burst threatens to cause ruin. House prices soar in London, (and so what is the thinking? Thus) let’s just move the problem to the towns, then when house prices soar there maybe the city and suburbs will be affordable again. I smell a rat – the rat of London, telling Pitsea to jump, and jump it does. Guy Debord’s great work Thesis on Traffic opined that planning and architecture, rather than being designed to accept the automobile as its central theme, should instead phase it out in the aim of reintroducing civil society as the foreground of urban life, social relationships included. Now, in urban planning, the problem isn’t just the automobile, it is area designed only to point to the most efficient way out. As such the opening out of Station Lane spells the antiquatedness of civil society in Pitsea (like it needed any more of a reason). The problem today of urban regeneration is that it is held hostage by the infectious capital centeredness of the city; more precisely it is the influence with which the surrounding area has on the town itself. Practical geographers, under the jurisdiction of Sir Dudley Stamp, take heed. Ed Miliband is atheist – so what? An hour ago, the press association ran a piece entitled “Ed Miliband: I don’t believe in God”. This relates to an interview with Nicky Campbell on Radio 5 Live, where the question was raised, and the answer carefully noted how important it is to be tolerant of people whatever their view. This will not stop the insults unfortunately. Nor will it help matters much that Miliband is the son of a Marxist heathen, unmarried, and the brother of an atheist who at least did his best by sending his child to a Roman Catholic school. None of these things matter of course; and as Miliband said in his interview, his views should be a private matter, much like the atheism of our deputy Prime Minister. But remember it is not just believers who have over-fetishised God in politics. Few may remember two years ago, when David Miliband was thought to be brewing a leadership bid, the philosopher and atheist A.C. Grayling making a plea in the Guardian for an atheist Prime Minister. It levelled many ridiculous claims that should divide a believing PM from a non-believing one; atheists will not receive messages from beyond if going to war; they will be sceptical about giving special privileges to religious organisations; sectarianism through faith schools will be a thing of the past; neutrality between religious pressure groups will be the order of the day; and they’ll take more “down-to-earth” views. Let’s throw this nonsense out of the water, just in case Grayling tries to write it again. Of course, nobody can actually receive messages from beyond, but if we are dealing with stupid reasons to go to war here, suggesting this is the preserve of the religious is to forget the wars authored by such tyrants as Stalin and Mao. This might evoke the redundant reaction given by the new atheists, usually that Communism is merely a demi-religion without supernatural Gods, and thus subject to the irrationality reserved by the religious (nb it also helps the “Ditchkins’” out in their mission to single religion out as only evil; secular reason as bringing only good). Will an atheist be any more or less sceptical about giving privileges to religious organisation? The infection that says some religions are more evil than others strikes through even the most ardent atheist too. Christian schools have long been a feature in the UK educational system, yet Islamic schools still have the effect of discomfort for some people, whether that person is religious or not. This may be more political than theological, but then many attitudes on religion today are. By no means am I saying that Ed Miliband will come to favour one religious institution over another, but what I will categorically suggest is that his atheism will not de facto ignore the level of favouritism or ill-feeling that is levelled at some religions, or even the level at which some secularists believe certain religions are far less compatible with secularism than others. Furthermore, on the question of educational sectarianism, such institutions do not have a state sanction to be sectarian, but to open a school with a certain religious value system. I’ve little doubt that Ed, even as an atheist, will be happy, or even indifferent, to religious values being attached to schools. Sectarianism in schools, where it exists, is kept quiet, and is certainly not allowed as such – in fact admissions in most schools are still subject to anti-discrimination measures. Moreover, this accusation, made by A. C. Grayling was made about David Miliband; who, as mentioned, did send his son to a Roman Catholic school. On possible neutrality between faiths, Ed Miliband has already upset Israeli supporters by speaking at at a Labour Friends of Palestine and the Middle East reception. It is inevitable that a political position will eventually upset faiths when politics and faith have become so intertwined. It is quite clear, therefore, that an atheist is just as liable as a believer – a further element overlooked by Grayling. And as for the point about Miliband being more level headed, this remains to be seen, but frankly the dividing line is not drawn between believer and non-believer, only in Grayling’s black and white mind. The claim by the Labour Party is that this shows voters already rejecting the coalition’s policies on cutting the deficit. But it is also worth noting that the “Conservative-run Derby City Council has found itself lobbying against the Tory-led national government’s spending cuts” according to Chaminda Jayanetti for Liberal Conspiracy recently. It is a strange set up, but the Tories have a minority administration, held afloat by the Liberal Democrats. In any case, even in the early stages, tensions across the political spectrum have begun to play out as response to the way the Osborne axe has fallen. As the severity of the cuts pervades through communites, the angry response will not wear political colours, but it should prove to be the impetus by which the Labour Party – post leadership election – set an alternative narrative to cuts. The welfare of people from all sections of society is, after all, Labour’s natural remit. Deep down I know that I’m still bitter that John McDonnell wasn’t able to stand as leader of the party – and I know very well that this view won’t be controversial to writers on this blog. I knew that I wanted to see at least one socialist in the contest – though when I found out which one would be standing, from the Socialist Campaign Group, I remember thinking, in truth, oh but not that socialist! I hadn’t the same problems with her as had other members of the Labour party I spoke to over the course of the many hustings I’ve attended. For example, her having been given a leg up by David Miliband didn’t make me think she was a token black/female/socialist (delete where applicable) candidate – we in the party have no reason to be tokenistic about such matters – nor did it make me feel that I should write her off full stop – there were other reasons for me to do that. Miliband the elder obviously extended his hand to Abbott because her inclusion added to the debate – a worthwhile gesture I felt. For some, this was an obvious impetus to view Abbott as a non-candidate and frankly ignore her. For me, this was not the case at all. I did however share sympathy with the view Abbott is a hypocrite. Of course sending her child to a private school lost her credibility among leftwingers and many constituents. Though her reasons for doing so were surely worse (that she is a single Mum with a black son who could get involved with gangs, was part of her justification for her move). This evokes another reason why one would be cautious of her: sometimes her criticisms of fellow leadership contenders went further than simply saying look at these middle class men, call this change? This was cheap, and was made cheaper when their race had been brought into question, like this means anything at all. Questions of race ultimately lead sound minded people to conclude that it is no matter, that people are people and so on. Raising questions of race as a means to show change in the Labour party is not possible, is dreadful and not sound minded at all. People said her campaign wasn’t effective. I imagine it just wasn’t loud enough, and let’s face it; we have all been more interested in the family feuds and Balls’ going forth on the economic illiteracy of Ozzy Osborne. I know the argument: stroppy teenagers and shop floor Mothers can’t relate to men in suits, yet they end up our representatives every time, and we wonder why people don’t engage with politics. But hold on, how people related to politicians didn’t spur on the anti-politics saga circa the expenses scandal, but rather the other way around, politicians obviously don’t quite understand the electorate – and subsequently fairness and respect for tax payers’ money. Frankly, this extends further to what politicians talk like, look like and smell like; if they don’t get, they don’t get it, and that trait transcends class, age, race and gender boundaries. For this reason, there is a strange element to Dianne Abbott’s recent trouble making, when she called the other four leadership contenders “geeky,” in an interview with the BBC’s Laura Kuenssberg. We’re used to the disengaged politician now, but it is patent nonsense for Abbott to suggest that she has more chance listening than they have. I won’t recycle the fact that the only difference between her and her colleagues (apart from her colour, more of which in a moment) is she has never been a SpAd and that she has been an MP for longer. But she has made decisions, and has said things, where you wonder whether the 20 years spent listening to her voters has counted for anything, particularly the type of thing she implies here which is that she knows what people want. The paradox: give me a middle class former policy wonk who admits to needing more knowledge any time, over a middle class, Cambridge educated, long time MP, who implicitly likens herself to Obama, and thinks she knows what the people want. I mean that as much as I do today. But yet – and here is the surprise – I voted for her as my first preference. Ed Miliband, who I felt was strongest to start with, quickly misread his place as unifier (the party being a broad church and all), holding back from laying into capitalism and instead attempting to spell out how he was going to reform capitalism or make capitalism better. I must admit, I agree with John Gray, the author, when he points out that both Miliband’s wildly miss the point, raised most notably in this country by their Dad, that capitalism will appear to modify in the face of threat – like it did in the thirties, seventies, eighties and now – the point is not to change it, but to understand it (in a reversal of Marx’ thesis on Feuerbach). In spite of this, I gave Ed Miliband my second preference. Though I’m sure he is serious about transcending the grip of New Labour folderol, I just don’t think he has it in him, nor do I think he knows what it means to do this. It is not simply ridding the party of New Labour architects, but it’s about coming into a new political landscape, and focusing on the politics to fit it. For me this is socialism, but to hear all candidates talk about socialism, you’d think it was a new idea not yet properly theorised or understood. Yet – and this was the basis of my choosing Ed for second preference – many trade unions and socialist societies saw in him the man they want. At a time when the party is moving away from the Fukuyama-type notion that unregulated capitalism has emerged successful and it is non-party political to allow the markets to be unfettered, we need someone to lead who is in debt to unions – who will be at their most pertinent when the coalition government tries to fob off public sector workers with pay freezes while turning a blind eye to outrageous banker bonuses and tax evasion – despite this, too, being a “non-party political” issue. David Miliband, too, has union backing, and the advocacy of the so-called voice of the intelligent left, Jon Cruddas. But, not only has this Miliband been the most uncomfortable with criticising the record of New Labour, his leadership will be easy pickings for Tories and Liberal Democrats when it turns out – if indeed he was – complicit in the use of torture. Indeed, he has already had his fingers burnt when denying the Britain’s role in torture, and if an investigation turns out evidence of his direct complicity this will be electoral poison for the Labour party – already on its back feet pleading forgiveness for a war gone totally awry. So at this stage you might be saying: well, Carl, if you dislike your two preferences so much, how much must you dislike your third, fourth and fifth? You’d be surprised at my answer. My third preference was Ed Balls – who I was most impressed by, for all the obvious reasons. He came across the most economically literate, while remaining astute enough to tackle questions on society, particularly the education sector which he still maintains a careful eye on. So why didn’t I vote for him, in spite of Paul’s well explained reasons as to why I, and you, should? Honestly, for character I find him displeasing – a trait I recognised around the time Sharon Shoesmith fought for and lost her job. But on an economic narrative to counter the one being passed off as orthodox by the coalition government, Balls has it spot on – there is an alternative to cuts in order to reduce the deficit in the quickest speed possible, and he has proved himself totally capable of projecting that – even if some, such as Don Paskini, see this as politically a dangerous move. In short: I don’t want a Balls leadership, I see in Balls a shadow chancellor; a job he should have probably had anyway under Brown. But to look at that in isolation doesn’t tell you the whole story. Ed Miliband is the realistic contender and I prefer him to his brother so, realistically, I hope he gets the job, which is why he got my second preference vote. But I desire to see a socialist as leader of the party, and now I think is the perfect time. Abbott is a socialist, and though I think she is a problematic candidate – for reasons spelt out above – it is for this reason she got my first preference. Dianne Abbot is the Real Miliband! It’s a sneaky move, sure, but what better way to try and undercut your fellow contestants in the Labour party leadership election, than to use the words of the Father of two fifths of the panel. 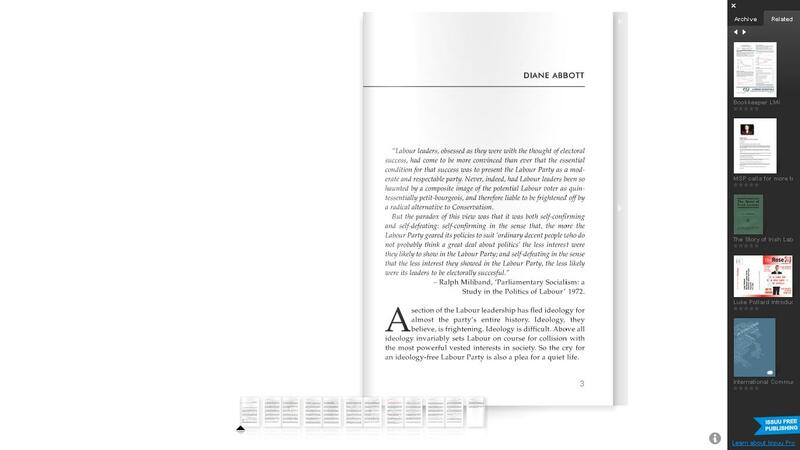 The Fabian Society have commissioned all five candidates to write a Fabian Essay, and Dianne Abbot has chosen to start her one with a quote from Ralph Miliband, Father of David and Ed (Miliband – for clarity). The message is clear: it has become a tendency for Labour party leaders to assume the only opposition likely to defeat conservatism is meek, mild politics, common among the petit-bourgeoisie. This exercise is both self-confirming and self-defeating. Self-confirming in the sense that the more leaders appealed to this type of politics, the less they were concerned with the natural politics of the Labour party. Self-defeating in the sense that the more the leaders lost interest in the politics of the Labour party, the less likely they were going to be electorally successful – which, it would appear, is the case right now. The implied message is clearer: all the other candidates have their eyes away from Labour, trying to appeal to an imagined voter, who happens to have droll politics. Dianne Abbot is the real Miliband!